This time of year we have so much to be thankful for and so much to celebrate. Personally, I am thankful to work in such an amazing school district with forward-thinking educators, supportive and involved families, and brilliant, creative scholars. I’m incredibly grateful for my family and friends, and for my two beautiful children who surprise and delight me every day. But today I am also grateful for the technology that makes it possible for me to learn and grow at every stage of my life. If it weren’t for computers and computer science, I wouldn’t be able to take free online courses about my favorite topics, or learn how to code without spending thousands of dollars at expensive institutions. I wouldn’t be able to connect with amazing educators around the globe, or research new ways of integrating STEM concepts into the classroom. I wouldn’t be able to see student thinking by way of their creations in applications like iMovie or Seesaw, and I certainly wouldn’t be able to share designs that students and educators develop with design thinking. Indeed, computer science affords personal and professional growth that I don’t want to imagine life without. As we work to prepare students for being able to prepare themselves for anything, computer science education must be a part of our discussion. 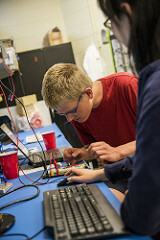 St Vrain embraces the importance of computer science topics integrated throughout the school day, not just as an after-school add-on for a few students. 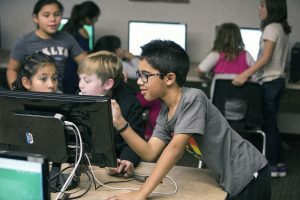 Teachers and educators throughout the district are creating opportunities for students to explore and discover through computer science – opportunities to help them become authors instead of just consumers. During the week of December 4th through 10th, 2017, St Vrain will join thousands of other school districts across the nation in celebrating Computer Science Education Week (“CSEd Week”), which gives us all the opportunity to focus more deeply on integrating computer science concepts into classrooms, activities, and after-school spaces. Made famous by the Hour of Code initiative launched by code.org, Computer Science Education Week is an annual event designed to inspire students to take an interest in computer science and to discover the connections between computer science and their everyday lives. To enhance this experience, here are a few ideas on how to highlight computer science in your household and community with your student during CSEd week, and beyond! Get informed: Visit our website, csed.svvsd.org, to learn more about Computer Science education and what St Vrain is doing to expand opportunities for our students. There, you will find pages specific for families and for community members with ways to get involved. Ask questions at school: Each school and classroom will celebrate CSEd week differently. Check with your school administrators to learn more about specific CSEd week activities at your school. If your school is not celebrating, ask about ways you can start this discussion in your community. Learn alongside your student: Many of us parents already feel surpassed by our children’s abilities with technology – but there are certainly things we can learn together! Code.org is a great place to start – it offers free tutorials and theme-based games for learning how to code. Google’s CS First also offers great and accessible content. Bitsbox has a complimentary online platform where you can create apps together. And if you want to learn more together about having a responsible digital presence online, check out Google’s Be Internet Awesome – a full world with gaming and learning options for helping us be the best version of ourselves both online and in real life. Learn “unplugged”: Don’t have easy access to technology at home? Unplugged activities have you covered! Csunplugged.org has a lot of free learning ideas for developing these concepts without staring at a screen. Share your expertise: One of the most beautiful things about computer science as an industry is the high level of collaboration it takes to accomplish any task. Join in that spirit and share your learning or your expertise with your classroom, your school, or even your neighbor! Show your student how much more we can accomplish when we work with other people. Follow the conversation: If you’re on social media, check out #svvsdcsed to follow what’s happening in St Vrain CSEd throughout the year. Thanks for reading, and I hope you find more than a few reasons to be grateful for Computer Science Education this year! And thank you for being a part of the St Vrain family – we are grateful for you!